When one mentions Thomas Keller, the celebrated French Laundry or Per Se (both boasting 3 Michelin stars) come to mind. But it’s not just haute cuisine that Keller dabbles in, with a handful of casual bistros (Bouchon) dotted across the States, as well as Ad Hoc – a family-style restaurant in Yountville that was originally intended as a temporary restaurant (hence the name), but due to its popularity is still standing four years on. There’s even talk of a possible Keller burger joint in the future, as he recently revealed his secret fantasy of opening a hamburger restaurant based on wine in Napa Valley. On our last visit to Napa we ate at both French Laundry and Bouchon, but failed to make it to Ad Hoc as our dining schedules were so jam-packed. A couple of nights ago I finally sampled something from the restaurant’s menu, but in the comfort of my own home. Unfortunately it was I (and not Thomas Keller) who cooked it, but it was delicious nevertheless! Tender chicken and vegetables in a velvety béchamel, under a buttery hat of puff pastry. Light, yet comforting – perfect for early Spring, when there’s glimmers of sunshine but still a slight chill in the air. I’ve kept the recipe pretty much the same but have simplified a couple of the processes to make it easier to whip up on a week night – the original calls for separate pans to cook each of the vegetables (who wants to do that much washing up? and more importantly, who has that many pans?) and homemade pastry (I cheated and bought some). I used leftover chicken from a roast we had the night before and the suggested mélange of veggies (I especially like that the celery is merely blanched so maintains a pleasing crunch), but feel free to throw in others – peas, sweetcorn or button mushrooms would make lovely additions. Place the prepared potatoes, carrots, and onions in a saucepan with the bay, thyme and peppercorns, then top with water to cover. Heat on a medium-high heat and bring to a simmer, leaving to cook until just tender (8-10 minutes). Drain the vegetables, and discard the aromatics. Spread out on a large dish and leave on a dish to cool. While the other vegetables are cooking, quickly blanch the celery for just over a minute in a large pot of boiling salted water. Drain and cool under a running tap (or in a bowl of ice water), then add to the dish of cooling vegetables. In a medium saucepan heat the butter over medium flame. Once melted, slowly whisk in the flour and cook for 2-3 minutes (lower the heat to ensure the mixture doesn’t colour). Whisk in the milk, adjusting the heat to achieve a gentle simmer, and cook, whisking occassionally, until the sauce has thickened and reduced to roughly 2 cups (30-40 minutes). Make sure you move the whisk over the bottom and corners of the pan to be prevent the béchamel from burning. Pour the completed béchamel through a fine-mesh strainer into a pouring jug. Add the parsley, thyme, and cayenne, then season with salt and pepper to taste. Scatter the vegetables and chicken into a pie dish (you can make one large pie, or several individual servings), and evenly pour over the béchamel. Carefully unroll the puff-pastry over the pie dish and cut off any excess around the edges, firmly pressing down around the rim to secure. Brush the top of the pie lightly with egg wash.
Place in the preheated oven (on the lower rack) and bake until golden brown (45-55 minutes). If the crust browns too quickly, cover with aluminium foil. Remove from the oven and leave to rest on a cooling rack for 10 minutes before serving. ~ by gourmettraveller on April 16, 2010.
oh good lord this sounds delish! wonderful! i have been wanting to make this for a while. it’s perfection at its best. what a killer recipe, thanks for posting this! This recipe looks amazing! Comfort food at its best. Thanks for sharing! It’s just so great to have something totally American to be proud of and Thomas carries that flag with rich confidence. Thanks for the recipe. Best from Montecito. this looks delicious! i’ve only become a chicken pot pie fan as an adult, so i enjoy trying new recipes to get different flavors. We didn’t plan well enough ahead when we were in Napa so we couldn’t get dinner reservations at Ad Hoc either, but we did manage to grab a seat at the bar area and enjoy fresh beignets! 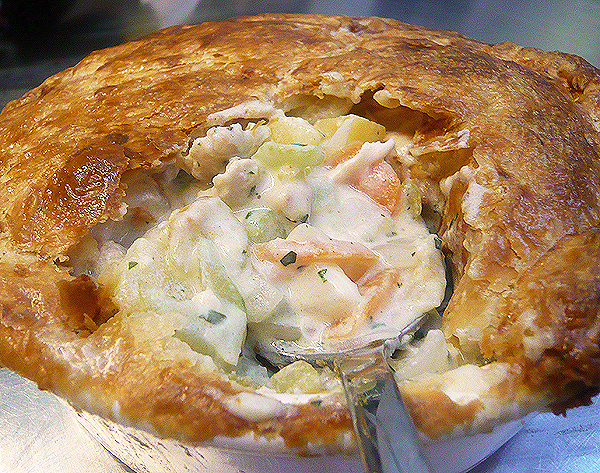 =) I’m going to try this pot pie. It looks fantastic…and that crust looks like flaky perfection.